On Saturday evening I spent some time at my favourite local cafe/bar Flirt for the launch of the Transgender Awareness Project 2014 organised by the brilliant Trans support group Breakfree. 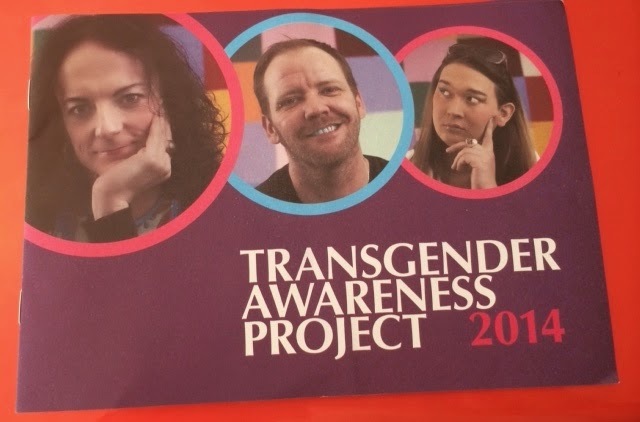 Much credit needs to be given to Jo Armstrong - Harvey for her fabulous photography skills and to the team who have put together a brilliant educational booklet to raise an awareness of transgender issues. The booklet gives great clear definitions, talks openly about the individualism of transitional journeys, raises the issue of hate crime and profiles some local trans role models speaking openly and honestly about what life is like for them. We need more of this! The church (yes the whole church) has a lot to apologise for, time and time again I hear stories where people have been hurt, rejected and cut off from their loved ones and congregations because of what the bible is supposed to say on matters of LGBT issues. For some people this impact results in them loosing connections and needing to re establish their lives some where else with other people. However for some the impact of this is far to much to handle and they make attempts to end their lives in order to end the problem as they see it. It breaks my heart to hear people say they thought there as no other way and as a Christian I believe that this makes Jesus weep! I believe we are called to support people in their journeys so that they may not merely survive this physical life but that they may indeed thrive beyond any expectation they could ever imagine. So here is the challenge friends can we be, as Christians more available to those people living on the margins of our community? Can we seek to make connections, to listen to peoples journeys and to attempt to love others as Christ loved us? Triple F is 1 Year Old!